Caffeine is a bitter, white crystalline xanthine alkaloid that is a psychoactive stimulant. In humans, caffeine acts as a central nervous system stimulant, temporarily warding off drowsiness and restoring alertness. 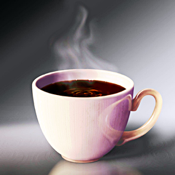 Caffeine is the world's most widely consumed psychoactive substance, but, unlike many other psychoactive substances, is legal and unregulated in nearly all jurisdictions. Beverages containing caffeine, such as coffee, tea, soft drinks, and energy drinks, enjoy great popularity; in North America, 90% of adults consume caffeine daily. The U.S. Food and Drug Administration (FDA) lists caffeine as a "multiple purpose generally recognized as safe food substance".